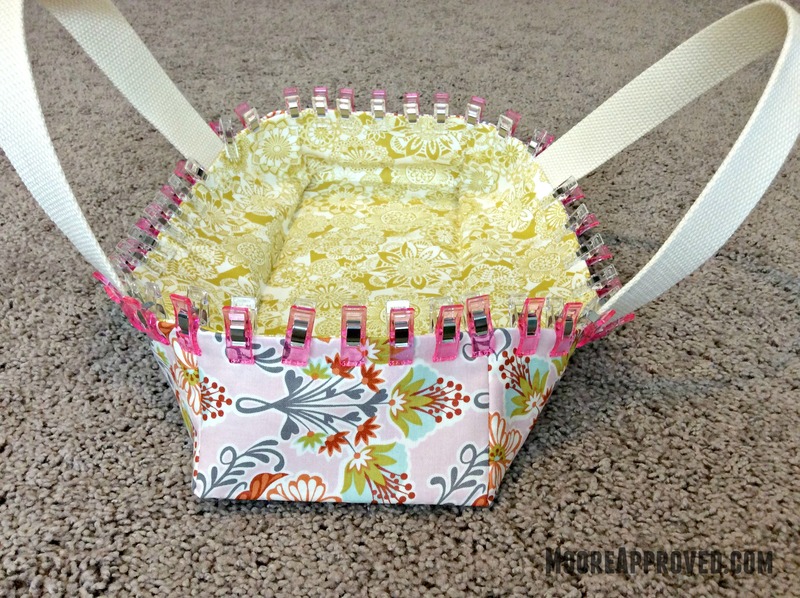 Making a fabric basket is a great way to build up confidence if you’re new to sewing. I put together a tutorial with lots of tips and shortcuts to make the process easier. This gift set is for one of James’ co-workers, who just welcomed a new (girly) addition into the family. 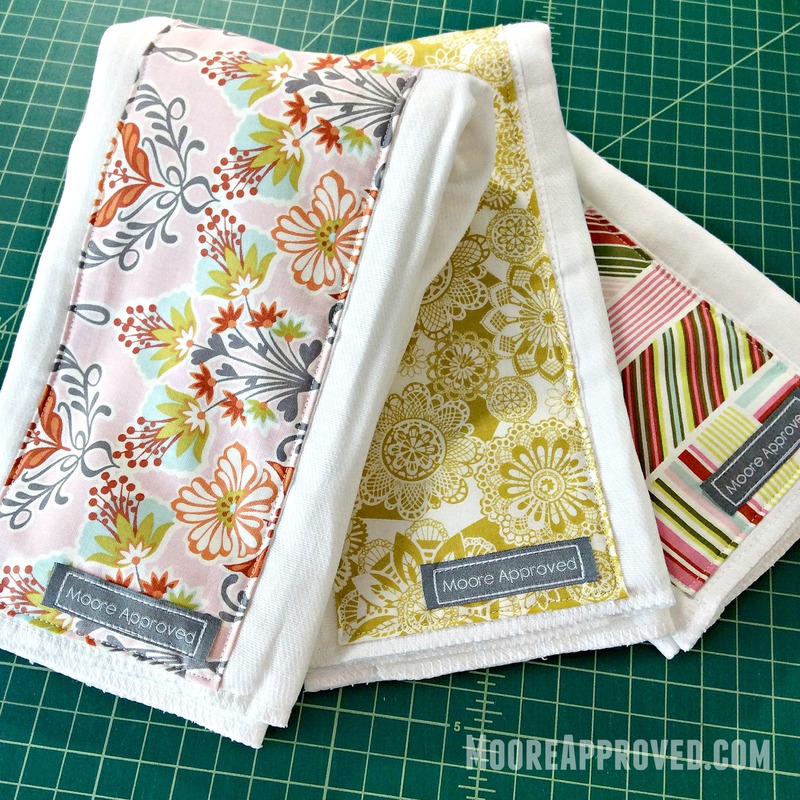 One of my favorite baby items to make is an extra special burp cloth for new moms. Besides being adorable – they’re also very practical around the house. 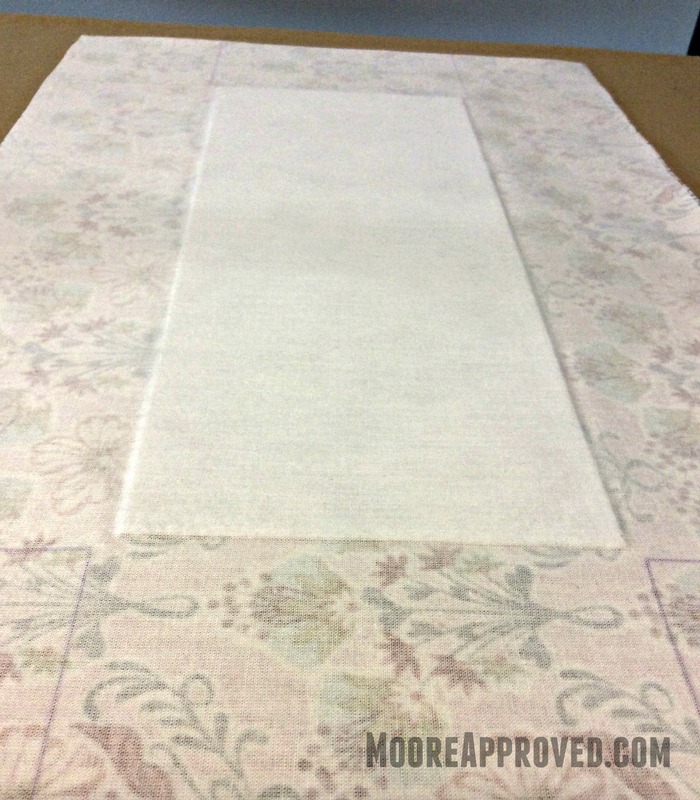 I always use this tutorial from Diary of a Quilter for ‘Perhaps the Easiest Burp Cloth Tutorial Ever.’ In my opinion, it definitely is! After finishing this set of three in about an hour and a half, I wondered what I could present them in. A zippered pouch? Tote bag? 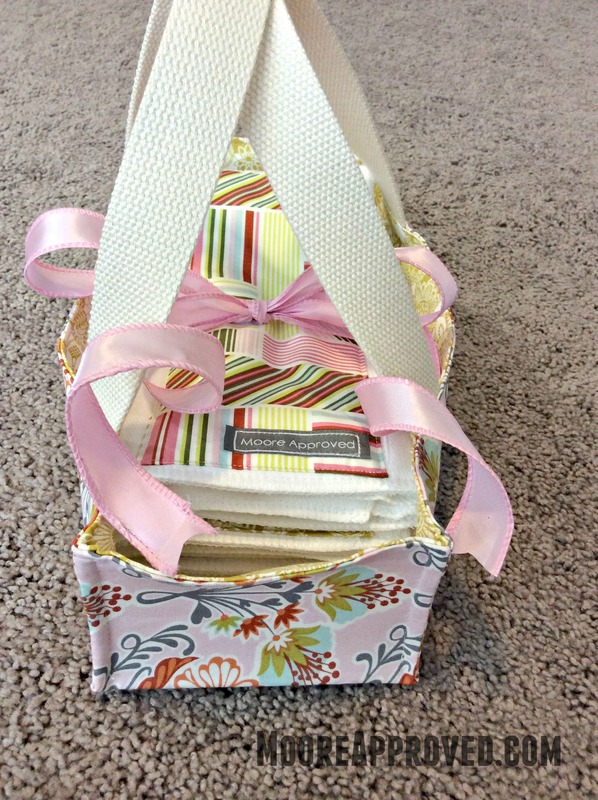 No wait… FABRIC BASKET! 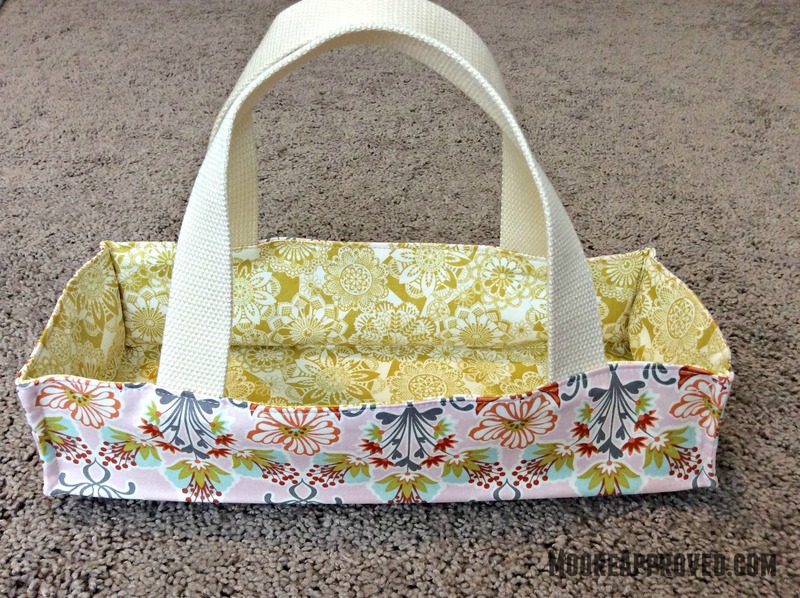 Due to its shallow height, I have named it the On The Go Fabric Basket. 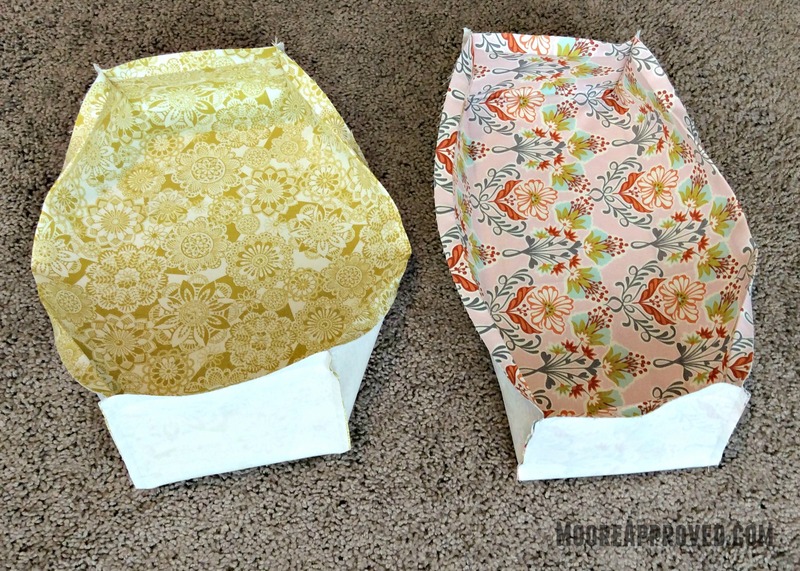 You can use it for sewing notions, organizing household items, or as a gift basket. The size works out perfectly with a fat quarter. 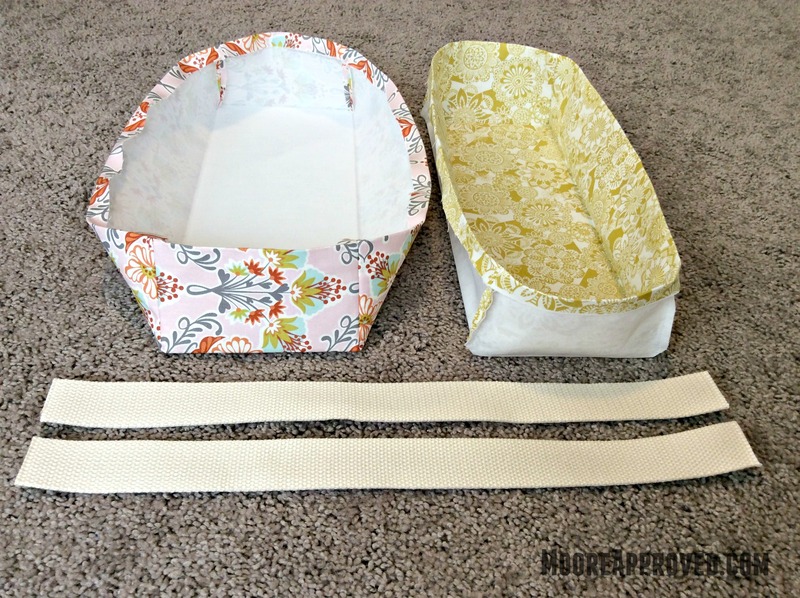 You can cut off a 5 X 20 inch piece first for the burp cloth, and use the rest for either the exterior or lining piece for the basket. 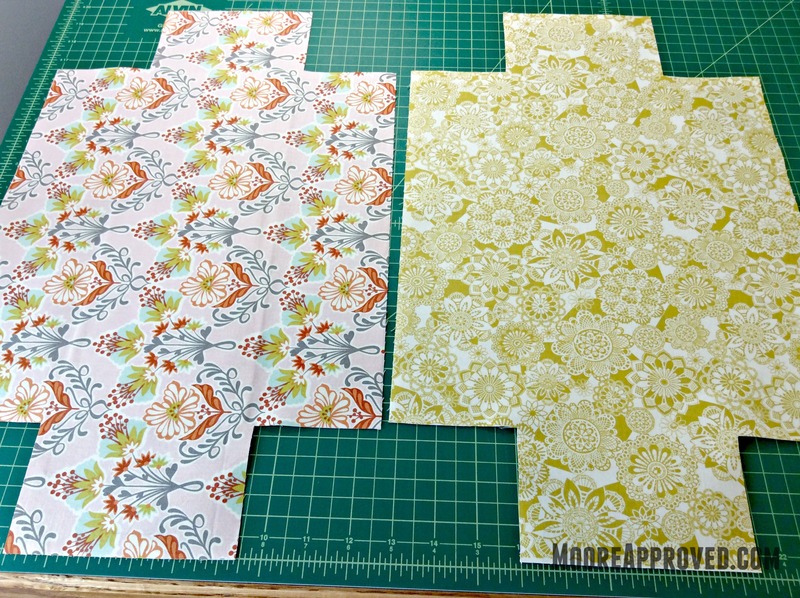 Cut out two pieces of fabric, and two pieces of interfacing (I used Pellon Shape Flex 101) all 12 X 20 inches. It’s best *NOT* to use a directional print as one side will be upside down if you do. Your fabric should look like this. 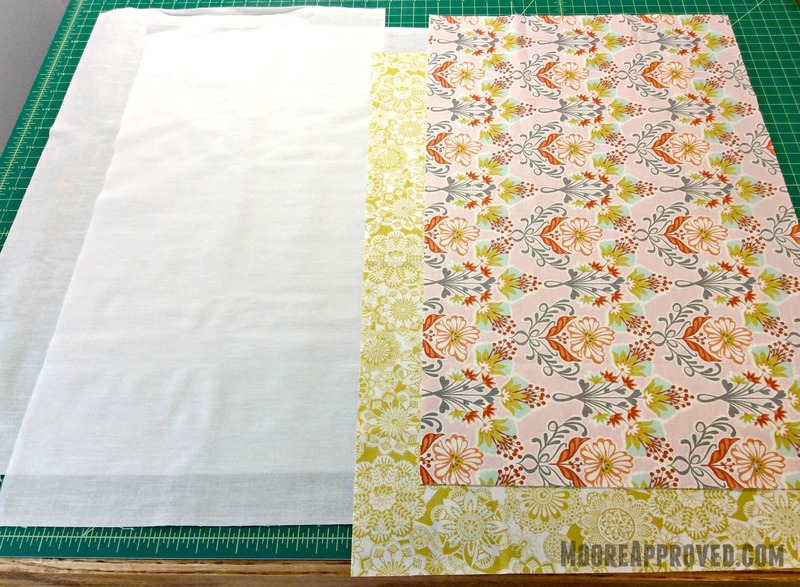 Cut out a piece of ultra firm sew-in stabilizer – like Peltex 70 – 5 X 13 inches. 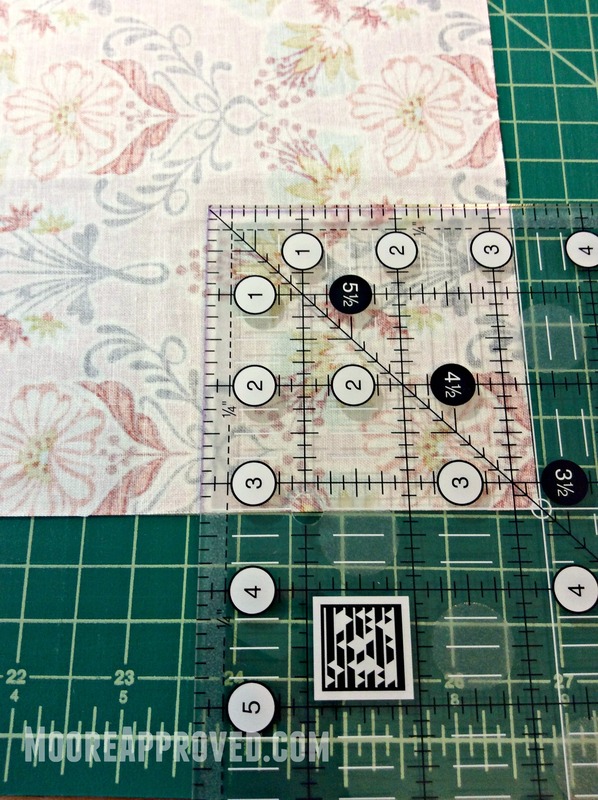 Center it on the EXTERIOR fabric using the marked squares as a guide. HELPFUL HINT: I used Elmer’s Washable School Glue to glue baste it before setting the interfacing on top. Fuse the interfacing to the exterior fabric with the ultra firm stabilizer sandwiched in between. Fuse the second piece of interfacing to the lining piece. 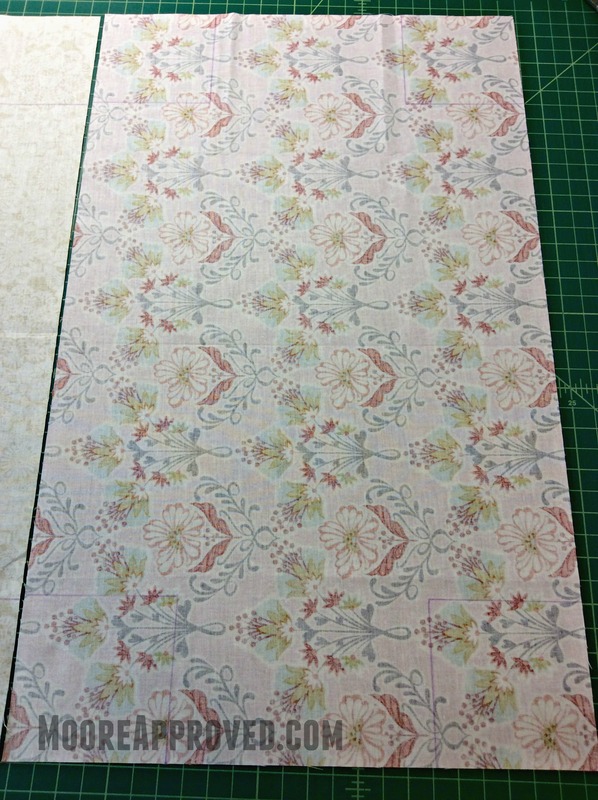 The lining will NOT have stabilizer in it. Using a good, sharp pair of scissors – cut out the squares you previously marked. 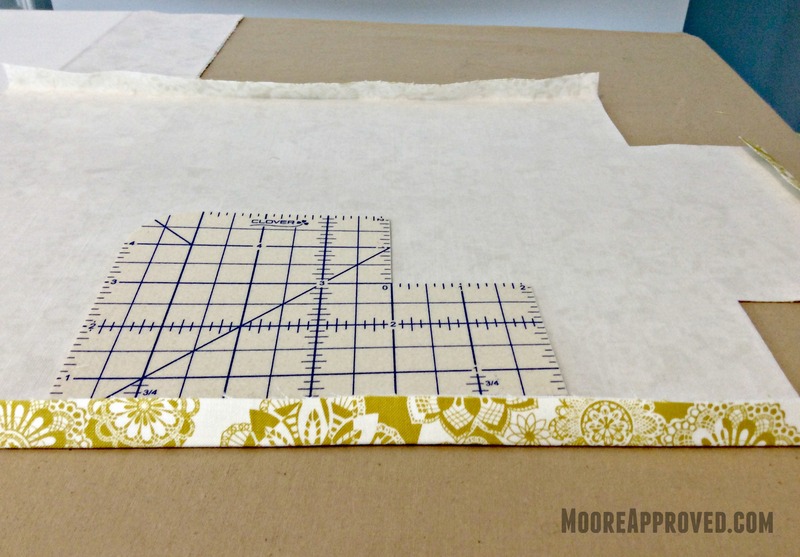 On each outer edge of the fabric pieces, fold and press a 1/2 inch inward. Using a Clover Hot Hemmer will make this a quick task and help your accuracy. I just got mine recently, and it’s been seeing heavy use in my sewing room! 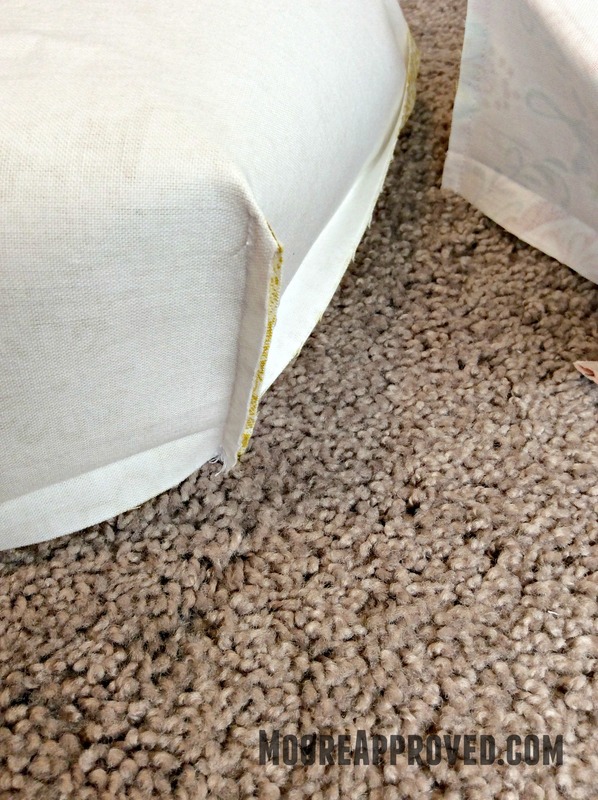 Using a quarter inch seam allowance, sew the four corners right sides together on both the exterior and lining pieces. Carefully snip the small folded section shown below on the bottom of each corner, and press all seams open. Re-press the 1/2 inches at the top of each piece and turn the exterior piece (left below) right side out. Using the corner seams as a reference point, mark a small dot 3 inches in on the longer side of the exterior piece. Do this for all four corners. Center each handle end on the dots and baste in place. I used a 4.0 stitch length, but went over the handles three times to ensure that they would not come loose while constructing the basket. It’s at this point you will want to switch your needle out for a denim/jeans needle on the sewing machine. Insert the lining into the exterior of the basket and line up the top edges, so they are even. Wonder Clip or pin the heck out of it! Personally, I prefer the Wonder Clips, because there’s less of a risk of injury to myself and they are so easy to clip to fabric – then remove. Make sure the handles ends are sandwiched between the exterior and lining. Because I wanted the corners to be more “defined” on the basket – I chose to also topstitch all four corners by pinching them together with Wonder Clips. This is what I ended up with. Overall, I am pretty satisfied with it – except for two small aspects. 1) Handles could be several inches shorter. I made mine 16 inches, but they could be 10 or 12 inches. They look alright, but I really envisioned a basket with cute LITTLE handles. 2) The sides are a bit floppy, despite using two layers of interfacing. I think they could be stabilized if I had cut out Peltex 70 pieces a tad smaller than each side panel and inserted them in between the exterior and lining fabrics right before sewing the top opening shut. I took measurements for the size these pieces would need to be and included them above in the “What You Need” section. If you make an On The Go fabric basket – free to tag @MooreApproved on social media (Instagram, Twitter) and use the hashtag #onthegobasket so I can see your creations!